Must Read Quotient—Overall value to an expat. Difficulty—Amount of brain power needed to power through the book. Educational Value—Level of contribution to your Panama education. Snooze Factor—Likelihood of falling asleep while reading. Character Development—Ability to connect with the book’s characters. Nicaragua was the favored location for a canal by most of the French and Americans involved in the project. The amount of dirt excavated from the canal was enough to build a Great Wall from San Francisco to New York—or 63 Great Pyramids. A train carrying said dirt would encircle the planet four times at the equator. And, if all the dirt were stacked in a column on a New York City block, it would extend 19 miles up in the air. In the final year of construction, there were 414 recorded deaths—30 white Americans, 384 black immigrants. In general, local Panamanians did not benefit economically from the construction of the canal, largely a result of U.S. commissaries supplying provisions to workers at low prices. Many locals had their homes and land taken from them and were arbitrarily relocated. The gap between Panamanian and U.S. cultures was wide—Americans were seen as loud, arrogant, rude and drunk and Panamanians as ignorant and grouchy. Corruption in the Panamanian government began with the very first president who reportedly stole $200,000 to $300,000 from the treasury, either directly or by inflating expenditures. The U.S. government had spent a total of $75,000,000 to acquire the Louisiana Territory, Florida, California, New Mexico and other western land, the Gadsden Purchase, Alaska and the Philippines. This was one fifth of cost of the Canal. In 1914, canal tolls totaled $4,000,000; in 1970, without any increase in the amount of the tolls, the total was $100,000,000. In 1974, tolls were raised for the first time; a 20% increase resulted in total tolls of $140,000,000 that year. The Canal remains fundamentally the same since the day it opened in 1914, a massive testament to the engineers who designed it. One of the biggest champions of the Canal, President Theodore Roosevelt, never saw it after completion. The Path Between the Seas is pretty much the Bible of the Panama Canal. 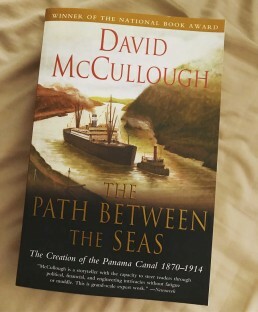 David McCullough’s level of detail about the Panama Canal—from conception through completion—is mind boggling and firmly establishes him as the undeniable expert on one of humanity’s greatest engineering feats. Panama was not yet a country, just a remote and dangerous territory of Colombia, when the French began to explore the possibility of connecting the Atlantic and Pacific Oceans with a 51 mile canal. McCullough takes you from France’s conception of the idea and first attempt at constructing the canal through the rescue and eventual completion of the project by the United States. I won’t sugar coat it—I groaned often as I read this book and fantasized about turning the last page almost on a daily basis. My hopes of a Michener-style fictionalized story with fascinating characters were immediately dashed by McCullough’s academic writing style. Being a nighttime reader, there were times when the level of detail was downright torturous and had the same effect as Benadryl—BUT, just like childbirth, the pain faded and I am very glad I stuck with it to the end. I’m grateful for the invaluable insight into Panamanian history that helps me understand both present day mindsets and current events. This is a must read for seasoned readers who are passionate about learning all there is to know about Panama! We are currently working toward being American expats in Playa Venao, Panama, and sharing our journey to inspire and help others do the same. Stay in touch so you can be one of our first guests at Vista Cañas Nature Retreat! We are a participant in the Amazon Services LLC Associates Program, an affiliate advertising program designed to provide a means to earn fees by linking to Amazon.com for selected items. Thanks to BIG business for supporting the little guy!